You know, you can think of almost everything as a math problem! The Math Curse by Jon Scieszka is my absolute favorite picture book! You can watch it here on You Tube or you can check out the book from your school library. Mrs. Fibonacci is right…everything can be thought of as a math problem and this week’s Math Minute has you doing just that…with your Halloween candy! The graph pictured at the top shows a stacked bar graph of Elizabeth’s (4th grader at Sunset) Halloween candy compared to her cousin Gabe’s candy. This is a tradition they started 3 years ago. Cool huh?! 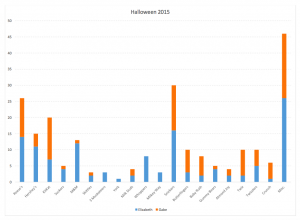 Create some sort of graph of your Halloween candy and submit it to your EY Coordinator. Check out some Halloween facts and statistics at the Huffington Post. Post a comment about something new you learned. It looks like Gabe trick or treated longer or went faster. I never knew that Holloween started out as an American tradition.